If you have a vision of the Pacific as a paradise firmly in your head, and reckon you might like to retire there and run a little newspaper, think again. This book quickly disposes of such dreams, providing some valuable insights into the diversity and difficulties for journalists in the region. Dec: Ruth Thomas, NZJTO's Noted: "The Pacific Journalist - valuable insights"
Dec: Professor John Herbert, AsiaPacific MediaEducator: "The Pacific Journalist"
Dec 31: Siau Smith, Kiribati Newstar: "Insights into the Pacific media"
July 18: Anthony Mason, Campus Review: "A Pacific point of view"
July 8: Russell Brown, Radio NZ's Mediawatch: "Pacific Report"
June 8: Sam Kaima, TUTW (PNG): "Journalism textbook for the region"
June 1: Ian Boden, executive editor of The National (PNG): "An unusual and insightful book"
May 23: Richard Dinnen, The National (PNG): "Judge a book by its contents"
May 13: David Robie, The Fiji Sunday Times: "Judge a book by its contents"
May: Laisa Taga, Islands Business/Pacific (Fiji): "When a USP book is not necessarily a Pacific book"
April 4: Michael Field, Agence France Press (NZ/Hawai'i): "Pacific reporters play balancing act between culture and stories"
April: Vicky Lepou, Wansolwara (Fiji): "Mangoes, colonists and media"
THE PACIFIC ISLANDS - sun, sea, palm trees and a lovely place for a mid-winter holiday. While the coup in Fiji may have dented this image a little, that's how most New Zealanders, some journalists included, see the neigbouring South Pacific countries. If you have that vision of the Pacific as a paradise firmly in your head, and reckon you might like to retire there and run a little newspaper, think again. The Pacific Journalist: A Practical Guide, edited by David Robie, quickly disposes of such dreams. At first sight, this book might appear to be just a useful how-to guide for students and journalists. But it is much more, providing some valuable insights into the diversity and difficulties for journalists in the region. In her foreword to this book, academic and Fiji Times columnist Seona Smiles describes how the Pacific is littered with instances of non-indigenous publishers and journalists being chastised and chased out. Last year, publisher of the Vanuatu Trading Post Marc Neil-Jones, who had lived in Vanuatu for 12 years, was deported with two hours' notice. The book also relates how widely respected New Zealand journalist Michael Field was banned from covering the 2000 South Pacific Forum because the Kiribati Government disapproved of some of his earlier articles. Since the book was published, Field has again been banned from reporting, this time from Nauru. 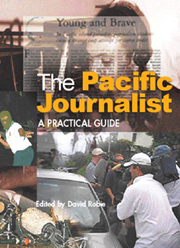 The Pacific Journalist was compiled by David Robie, the coordinator of the journalism course at the University of the South Pacific, with contributions from working journalists, editors, journalism educators and trainers. Robie has a wealth of experience and first-hand knowledge of the region, first as a journalist, and later at the universities of Papua New Guinea and the South Pacific. He says the publication of The Pacific Journalist was delayed last year by the coup in Fiji. Some of the chapters were not written, or were incomplete when the book was published. But the book makes it clear that the coup has not only impacted on Fiji but also caused enormous debate on how to deal with culture and conflict in the South Pacific. Of all the challenges for a Pacific Islands journalist, politics is perhaps the biggest. One contributor to the book, veteran Fijian journalist Jale Moala, has been working in New Zealand since the coup. He contributes a fascinating chapter on the difficulties of politics in the South Pacific. He says politics is so often mixed up with with issues like culture, the extended family system, and tribal and chiefly loyalties as well as customary obligations that it can become difficult for reporters to maintain impartiality and direction. When George Speight and his followers overthrew the elected Fiji Government last year, and the police were trying unsuccessfully to bring the situation under control, it was important for the national radio station with many indigenous listeners to be accurate and responsible. But under the pressures of the crisis, Radio Fiji allowed Speight supporters to make inflamatory statements live on radio, first to try to legitimise the events that had taken place and later to call for support to move into the parliamentary complex to bolster Speight's forces. Moala says the radio station was suffering from confusion about who was in power and would end up in power, combined with lack of newsroom leadership. Pacific journalists face many challenges. If they are not always on the scale of the Fiji coup, there are nevertheless no easy answers. They come from societies that impose large cultural burdens, where English is their second and even third, where poverty or hardship is rife, or where in the case of Papua New Guinea less than half of the population is literate and there are at least 867 languages. In some South Pacific societies there is a deep rooted belief and respect for authority, coupled with a strongly disapproving attitude towards those who question, probe and publish that is contrary to the need for a journalist to be curious and independent. One example cited in the book is from Tonga. In the late 1980s and 1990s, one newspaper in particular expressed views opposing the kingdom's royal and noble social system. The publisher was 'Akilisi Pohiva, who was also an MP. He was hounded by the authorities, labelled anti-royal amd a cultural misfit and other journalists were vilified. Josefa Nata, who later gained notoriety over his involvement with George Speight, was another example. He returned from studying in Britain in 1986 and reported on the business connections of Ratu Sir Kamisese Mara, who was at that the time the Fiji prime minister. Though the report was not malicious, it was seen as breaching "vakaturanga" custom, the sacred boundary that keeps commoners and chiefs apart. Nata, who came from the same group of islands as Ratu Mara, was criticised, even by members of his own family and threatened. He was treated as an outcast and for a long time had to stay away from traditional gatherings of the clans. Even day-to-day journalism routines such as using file photos to illustrate stories can be fraught. David Robie describes the case of the Fiji woman senator who made a newsworthy speech that a newspaper picked up and ran along with a file picture of her. The file photo showed her in a colourful dress. But on the day she made the speech she was in black, out of respect for a dead relative. She said the paper had made her look disrespectful and the Senate condemned it for misrepresentation. Cultural differences aside, there are many other difficulties. Journalism lecturer Philip Cass in his chapter on the legal systems describes the main differences between the legal systems operating in the Pacific - American law (Marshall Islands, Guam, American Samoa); French law (French Polynesia, New Caledonia); and law derived from Britain. In the two largest Commonwealth countries [in the Pacific], Fiji and Papua New Guinea, governments have had strong views about socially responsible journalism and have threatened to introduce legislation that would curtail media activities. In Fiji, both Indo-Fijian and indigebous Fijian-led governments have sought to formulate laws to control the media. In Papua New Guinea, fundamental rights, including freedom of expression, can be abridged if in the opinion of Parliament it would be in the interests of defence, public order or public safety to do so. Freedom of information is also intended to apply only to citizens. Thus a foreign journalist is constitutionally less free than an indigenous journalist - in Fiji and Papua New Guinea as well as the Vanuatu instance and in Kiribati. Finally, even the news values can be different. Robie tells us there are different news values in the "four worlds". For example, in the first world, New Zealand, Australia and the United States news is current and has proximity, prominent people make up news as do unusual and odd events, conflict and disaster. However, in developing "third world" countries, in Fiji, India, Papua New Guinea or the Philippines, where nation building is still occurring, news is about development and progress, news is growth, whether it is a new dam or a new building. News is also responsible, and emphasises positive achievement, pride and unity. It's a fascinating book. It's worth reading. Ruth Thomas is module leader of the Graduate Certificate in Journalism course at Auckland University of Technology, New Zealand. Copyright � 2001 Anthony Mason and Asia-Pacific Network. This document is for educational and research use. Please seek permission for publication.